Book Details: Book shows little use and binding is excellent. There is some wear on the outside lower end of the binding and cover. 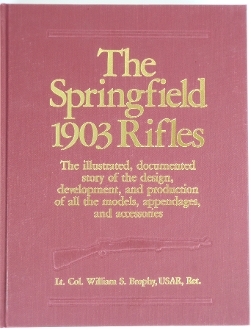 Great reference and historical book of the Springfield 1903 rifles. The illustrated, documented story of the design, development, and production of all the models, appendages, and accessories. Hard cover about 9”x 11 1/2”.